The six-month long Madhes-centric agitation against the new Constitution in Nepal has now become Kathmandu-centric. Since 14 May, the Madhes-based political parties together with hill-based indigenous (Janajati) political forces - including the Sherpas, Magars, Gurungs and Rai-Limbus - have come together in a joint front called "Federal Alliance" in their bid to oppose the new Constitution promulgated on 20 September, 2015. The Constitution curtailed much of their rights enshrined in the Interim Constitution 2007. The agitating groups have placed 26 demands before the government, which includes re-writing of the Constitution. With a view to creating pressure on the government to address their grievances, thousands of political cadres belonging to Madhes-based political parties and hill-Janajati groups have been opposing the Constitution by organising different forms of protests. Towards this end, they organised rallies, performed a two-day sit-in programme at Singha Durbar, the administrative unit of the government and a one-day sit-in programme at the official residence of the Nepalese Prime Minister. The government, however, turned a deaf ear towards their demands and termed the agitation as "pointless drama"
Therefore, the agitating groups extended their protests for 10 days. 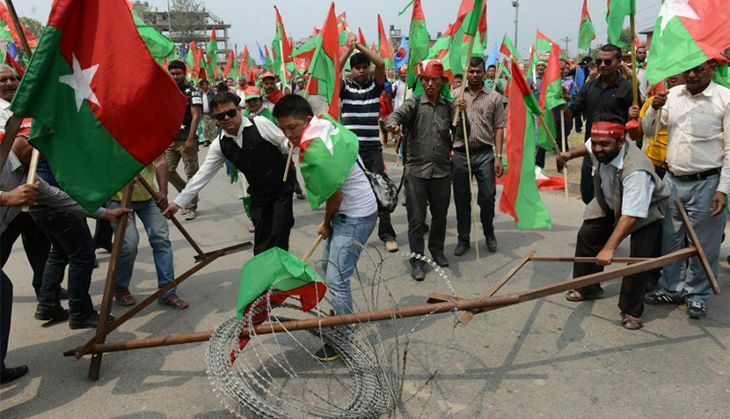 Accordingly, they have been protesting against the Constitution in Kathmandu Valley and also in Pokhara and Birgunj. Over last few days, people's participation in the agitation is growing, despite the government's attempts to thwart it..
Of course, the government sent letters inviting the agitating groups to come forward and resolve differences over Constitution-related issues. But the agitating groups rejected the offer stating that the government wasn't serious about addressing their concerns in the three dozen times talks were held. They also add that the government hasn't created a congenial atmosphere for dialogue. However, there is growing anxiety over the stand-off between the government and agitating groups. Many fear that Nepal would move further towards political instability and the situation could become violent if the stand-off continues for long. Last year, such a standoff led to an economic blockade of Nepal for 5 months, which created severe shortage of such essential items as oil and cooking gas in the country. According to estimates, each month of blockade caused a loss of $2 billion to Nepal's economy. The entire economy was paralysed and Nepal's rate of economic growth has become negative. On top of that, 58 agitators lost their lives and thousands were injured during that period. Human rights bodies have highlighted the excesses committed by the security forces against the agitating groups. 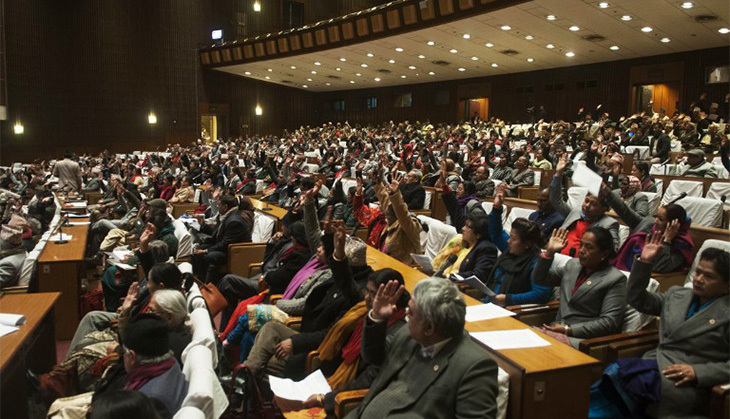 Unfortunately, the government does not appear to be in a mood to address the demands of the Madhesis, Janajatis, Muslims, Dalits and women groups, constituting over 70% of Nepal's population. Both the India-Britain and India-European Union press communiqués released at the end of visit of Indian Prime Minister Narendra Modi's to Britain and Brussels, Nepal was advised to make the Constitution inclusive and accommodate the concerns of different agitating groups to ensure peace and political stability in the country. Even US Secretary of State John Kerry gave similar advice to Kamal Thapa, Deputy Prime Minister of Nepal. But the government of Nepal not only ignored such friendly advice but even opposed it. To make matters worse, the government of Nepal in its recent policies and programmes has made an announcement to hold local level elections by November/December this year. In political circles, such a step is seen as as an effort to institutionalise the new Constitution. However, there is no sense in conducting this election as local elections fall under the jurisdication of states and the issue of demarcating states hasn't been resolved as yet. In 2005, King Gyanendra also tried to conduct local level elections, pending in the country since 1997. But he failed due to strong opposition from political parties. Lack of flexibility on the part of the government to address the problems of the agitating groups is likely to intensify the confrontation. But this time, the Kathmandu-centric agitation is likely to be more effective than the Madhes-centric agitation as it has the support of the hill-based indigenous groups and other political forces in Nepal. Besides, Western powers also appear to be sympathetic towards the cause of the Madhesis and Janajatis. In view of this development, the state needs to avoid a confrontation by addressing the core demands of the agitating groups such as the formation of one or two states in Terai, parliamentary elections on the basis of population, proportional representation and removal of discriminatory provisions in citizenship-related rules. Rewriting the Constitution is unavoidable for addressing these demands.